SHAWLS, Y'ALL? THE JORONGO, The MEXICAN, TRADITIONAL COAT! The Rebozo? The pashmina? The Mexican Indians who could weave wonderful, wool rectangles never thought of CUTTING the finished weaving into PIECES with scissors and slicing out sleeves, armholes and then, sewing coats! They were into economy, respect for the weaving and instead, wore the whole blanket! WISE DECISION, Mexico. The Jorongo is a very large, coat-like weaving with a single slit in it for the head. That slit which you cannot see in the photo, goes right down the girl's middle. THE REBOZO! In CONTRAST, The REBOZO is longer and SCARF LIKE, being a long, thin woven blanket, fringed at both ends, made of light weight,stretchy wool or cotton or even silk. 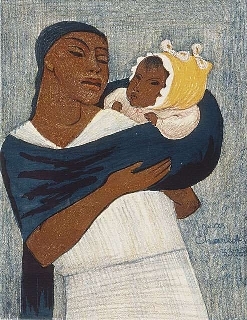 The REBOZO is worn over the woman's shoulders and is long enough to wrap an entire, fat baby in the middle, catching the child against the body, safe in a hammock of strong fabric. One end was wrapped around the mother's arm in a way that she could TIGHTEN THE BABY or let him swing, recreationally over her tummy,hearing her heart beat with one ear. 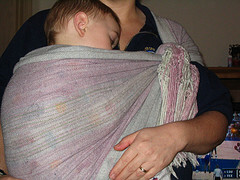 She could breast feed without being seen, too, which our new, high tech American baby holders would not allow at all! Again, a WISE decision, Mexico. To get your colors right, you want to take swatches of pure color cut out of bolts at the local FABRIC STORE, and carry them to your weavers. Suggest stripes of monochromatic adjacent hues. Purple/blue/ Turquoise. That's what you call your BLUE SHAWL. The rose/red/orange/ touch of Gold is the RED SHAWL. The vibrant emerald next to softer leaf green a stripe of green blue, is the GREEN SHAWL. Tobacco/brown/russet colors suit redheads. Gem colors suit brunettes. Blondes always want pale tan, beige, cream, so you gotta shop for blondes and dye wool in blonde colors. 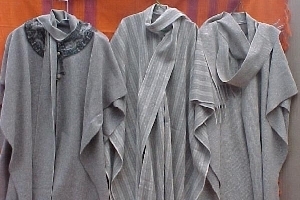 You see how much these garments resemble the PASHMINA. (soft, cashmere scarves from Asia, highly sought after by Vogue/ Bazaar Magazine types.) usually found for $400 and up. http://www.victoriana.com/Cashmere/Cashmere-shawls.html is about the tradition of the shawl, and very interesting! You may wonder if Mexican shawls & rebozos, jorongos and hey, the whole line, jewelry, decor, etc....would sell in modern cities, college towns. I feel that UNIQUE DESIGN Jewels, CLOTHING, DECOR that was hand made in MEXICO is obviously HOUR INTENSIVE stuff and that is FAR FROM what is generally available in THE GREATER CITY area, so it sells! Wherever you go in Mexico, you find objects we love. The fisherman's sweater, for instance. I USED TO ADORE the big bulky handmade sweaters from TOLUCA (cold area,) right up in mountains near Mexico City. They have sheep so they learned to KNIT! Peruvians also knit. Throw some alpaca into the wool, you get a cashmere feel and South American countries have the soft alpaca. The fabulous RUANA from Bolivia is a must handle for an importer! The cut would be half way thru it HORIZONTALLY, right in middle. Your head went thru cut, the thing was over your shoulders, LOOKING AT YOU from front. It os open down the middle. Sweater like Fringe was at calf level. So you wore skirt, boots, a white blouse and the collar and cuffs were visible. A turtleneck long cotton jersey or sweater underneath. The jorongos I liked most were made of soft rebozo wools and I believe had some acrylic in it, as the wool wasn't at all scratchy. It looked like wool, though. It had horizontal stripes of graduated shades, so the BLUE ONE was turq and ultramarine . The ORANGE one was orange and russet and gold. The RED had all different shades of rose. FABULOUS monochromatic OMBRE color choices. Like to see those as Amer gals would love em. OAXACA weavers. I googled the word jorongo, came up with some but not the ones I'd seen which were lighter weight not itchy wool like this one here, and in colors kind of hot blues, hot pinks and no mixing of colors, adjacent colors for better taste. MEXICAN imports will always sell. HANDICRAFTS will sell. Wade into this pool, there is no way you will ever get stuck with merchandise weighing you down, drowing in you in debt. What costs you a dollar abroad you will sell for TEN dollars here. NOBODY can do that in the Stock Market. That doesn't mean you shouldn't check all your importing competitors in your city and adjacent cities. If they have SWEATERS and JORONGOS, you want to know what they're gettting for them, and do your designs differently if possible. That means going into the field and instructing weavers on specific softness, colors, etc. NEXT, as you distribute merchandise in your city, seek to get your own outlets. Sure, the big DEPARTMENT store is a target of all local importers. But get some new ones. You will seek your own retail people, you will generally find that CAFES with boutiques work well, dress shops, boutiques, even HAIR SALONS. Any store that can sell 20 sweaters a month, or twenty mirrors, or whatever, you need to nail down. Our 'POSTER-BLOGGER' is ANITA SANDS HERNANDEZ, Los Angeles Writer, Researcher, Humorist, Ombudsman, Futurist as she's a mother of 4, grandmother of 6, also a career Astrologer. Catch up with her websites TRUTHS GOV WILL HIDE & NEVER TELL YOU, also The FUTURE, WHAT'S COMIN' AT YA! FRUGAL LIFE STYLE TIPS, HOW TO SURVIVE the COMING GREAT DEPRESSION, and Secrets of Nature, HOLISTIC, AFFORDABLE HEALING. Also ARTISANRY FOR EXPORT, EARN EUROS....* Anita is at astrology@earthlink.net ). Get a 15$ natal horoscope "my money/future life" reading now + copy horoscope as a Gif file graphic! No smarter reading out there anywhere near that price. REPUBLISH ANY OF IT. As you wish. CREATIVE COMMONS APPLIES.